A folding shovel is a useful, compact hand tool - reliable, rugged and up to a hard days work. The five best folding shovels reviewed and compared. A folding shovel can come in handy for a range of reasons - not least because they're compact yet fully functional, rugged and easy to store, and great for digging trenches and small to medium holes for posts or to clear ground prior to working in or around it. Though they're often bought for use on camping trips and outdoor adventuring, they're just as useful to the average working man and are, in many ways, similar to an outdoor push broom or wheelbarrow - they're deceptively useful. The best collapsible shovels are made of tough stuff and will scrape, dig and scoop without any issue. The five best folding shovels are featured below. Each one can be found on the best seller lists, they're all great value for money and, as hand tools go - largely inexpensive. 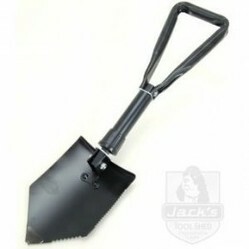 This is the best selling folding shovel overall and it's sold at an incredibly affordable discount price. It's solid and durable - it won't win prizes for it's ability to shift tons of earth but it will do an admirable job of clearing debris, creating small holes, shifting sand and cement and so on - plus you can use the base almost like a hammer - handy feature. It's a snap to open, a simple enough slide mechanism does the job and once it's opened up it's surprisingly user friendly and tough. The shovel head is constructed out of carbon steel, so it's not a lightweight blade and the shovel comes with a nifty bag that's useful for storage and transportation. None too bad, does the job - good quality for the price. This one's a cheap folding shovel but nonetheless - it's still a best seller and not too bad in the ratings department. There's a grumble or too about its size and quality but - you sometimes get what you pay for. You're not paying for a high end manufacture - this one's almost being given away at less than 4 bucks and despite it diminutive size, it's fine for throwing in the trunk or storing in the garage. It's not up to anything heavy weight but it will scoop, scrape and let you haul light weight stuff from A to B. The head of the shovel is constructed from tempered steel and the rubber grip on the handle is good enough and does its job. Nothing to write home about - just a small, reasonable mini folding shovel that's sold at a price so low it's worth it for that alone. Another best selling folding shovel - this time with a serrated blade and a full stainless steel construction. By rights this is a trowel and not a shovel but having had the use on one, the head's big enough to do more than dig holes for plants and it's certainly up to more than a bit of weeding around the borders. Being stainless steel, it won't rust or fall apart in a hurry and it's fairly decent when the handle's locked into place. I wouldn't put it up to shifting a few boulders but it will tackle lightweight work well enough. It's fine for the price, does what you need it to do - and won't blow a hole in the bank account. This is the superior version of the previous Gerber folding shovel - serrated edges to the blade, tougher construction and of course a superior price tag. Still - you're getting more for your money with the quality of it's manufacture - the shovel head is carbon steel, powder coated and the handle and shaft is nylon and almost impossible to use to destruction. The serrated edge adds to its digging power - it's extremely rugged and will help when you're faced with rough terrain or stubborn roots. Plus it's more than capable of shifting considerable weight - despite it's compact size. The locking mechanism is stable, no wobble and feels solid when you're using it and when you're not it folds down small enough to drop into a tool chest, trunk or store easily in the garage. Well designed, top quality fold-up shovel. This folding shovel is a multi-functional tool lots of features and a big favourite with survival and outdoor enthusiasts. As a collapsible shovel for the average home owner or industry worker - will it do the job? Forget the 'survival' kit - most is only good enough for the scouts anyway. The shovel itself is good quality and that's the part we're interested in. It's solid tempered steel construction is tough enough to dig and scrape with, the head is just about big enough to shift material around and the fact that the angle of the head to the handle is offset differently to the other featured products is actually a plus rather than a negative. It's good and rugged, the folding mechanism is stable and it folds up nice and compact when not in use. And for less than ten bucks - it's a more than good enough deal.